While the singing competition "The Voice" is returning in March, Adam Levine is will be hosting late night sketch show Saturday Night Live for the very first time on Jan. 26 along musical guest, rapper Kendrick Lamar. 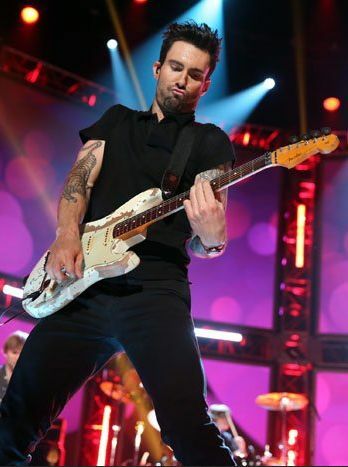 It shouldn't be too hard as Adam performed many times on the SNL stage. Maroon 5 singer Adam Levine is due to be the new host of NBC's late night show "Saturday Night Live" since end of the month, January 26th. While the singing competition "The Voice" is returning in March, Adam Levine is will be hosting late night sketch show Saturday Night Live for the very first time on Jan. 26 along musical guest, rapper Kendrick Lamar. It shouldn't be too hard for Adam to host it, as he performed many times on the SNL stage. Before that, Hunger Games and Silver Linings Playbook star Jennifer Lawrence will host the show on Jan. 19 with musical guests The Lumineers. Levine has already started moonlighting as an actor last fall with a cameo as a doomed lover on "American Horror Story" and wrapped filming on the Keira Knightley film "Can a Song Save Your Life?" .